This will be a long post: you have been warned. Since I have not heard back from the local library if they will find me a copy of David Kibbe’s Metamorphosis, I am currently relying on people on the internet who have compiled the “rules” for the Soft Classic style as I make my sewing pattern list, similar to the one on Dr. T Designs. However, unlike her list, I am really doing this to gather my own ideas and create a focus for my own sewing. If you want to see lots of ideas in all the categories of clothes, definitely head to her Soft Classic post. In fact, her entire “Sew Your Kibbe” series is fantastic, and she is now starting a “Sew Your Kibbe” Challenge, which I am going to meld into the Make Nine Challenge that I also want to work on for 2019. The blog This Enchanted Life has posted the overview of the Soft Classic style type from Kibbe’s book, and in summary, the idea of Soft Classic is classic first, with accents of Romantic “to gracefully soften the overall effect of your appearance” (Kibbe). The overall silhouette is a graceful and elegant clean rather than clingy look, with soft draping, flared and flowing lines, and symmetry. Everything about the look should be smooth and controlled, with a hint of femininity without going over the top into what (on the soft classic) would be perceived as gaudy. Details like necklines and sleeves should have soft edges and round shapes, and fabrics should be light or medium weight in encourage a soft drape and flow. Kibbe even recommended fabric types, like silks, challis, crepe, cashmere, velvet, lighter linens, others that have light and soft textures, and he encouraged they have a “slight matte or slight sheen.” He stated that waist definition is essential, and flared shapes are best. SHAPE: Soft, curved shapes with rounded edges. Smooth, symmetrical shapes that flow gently. Circles, ovals, subdued swirls. LINE: Gently flowing lines that flare or swirl. Clean lines that are unbroken. Smooth, horizontal, or diagonal draping. AVOID: Hard-edged geometric silhouettes (boxy shapes, square necklines). Overly ornate or intricate lines. Sharp, severely straight lines overall. Straight lines without flow or shaping. Overly crisp and fitted/clingy shapes. DETAIL: Detail should be smooth and symmetrical, composed of rounded shapes with slightly intricate edges. Clean, soft necklines. Draped necklines, soft cowls, jewel or scooped necks, subdued intricacy (gathers, shirring, soft pleats or folds, etc.). Tapered to wrist sleeves and a defined waist. Subdued trim is possible (beautiful and unusual buttons, small gathers or ruffles, shoulder tucks or gathers, beading, delicate lace). AVOID: Sharply tailored detail. Wide, unconstructed detail. Overly ornate or fussy detail. Animated, “perky” detail. Minimal “no detail” or plain looks. SEPARATES: Use carefully and sparingly. Separates are effective only if they are part of a well-matched, “ensemble approach” to your head-to-toe appearance. Keep the colors, textures, and fabrics elegantly blended and avoid a staccato look. COLOR: Your use of color should be soft and luscious within your complimentary palette. Pastels and moderately bright tones are best while light neutrals are quite elegant in luxurious fabrics. Color combinations should be softly monochromatic, with intensities blending together rather than sharply contrasting. Light/bright color combinations are especially effective on you. AVOID: Multicolored splashes (colorblocking). Head-to-toe dark color schemes (dark colors will need softening and brightening). Sharply contrasting color schemes. PRINTS: Prints should be soft, flowing, and watercolor. Abstract rounded shapes that swirl into each other are excellent. AVOID: Sharp geometrics, small symmetrical prints, Animated “cute” prints. FABRIC TO AVOID: Heavy, stiff fabrics. Rough, thick textures. Bulky knits. Overly sheer fabrics. Extremely shiny fabrics (except for evening). Extremely dull-finished fabrics. Shoes: Delicate, tapered shapes. Narrow heels and toes. Slightly bare (sling-back, open toe, etc.). Delicate, feminine flats. AVOID: Angular styles. Chunky styles. Plain pumps. Belts: Narrow to moderate width. Elegant, slightly ornate buckles. Exquisite leather, skin, or fabric. AVOID: Wide, stiff styles. Overly ornate styles. Bags: Small to moderate size, Rounded shapes perhaps with slight trim (gathers, shirring, etc.). Clutches or moderate straps. Supple leather. AVOID: Overly large styles. Angular shapes. Hosiery: Moderately sheer skin-tone or light colored styles are best, especially if they match the shoe OR hemline. The only exception is in the evening, when the dark stocking is ultrasheer. AVOID: Extremely opaque stockings. One long line of dark color. Three-color looks (stocking/shoe/hemline contrasts). Heavily textured stockings. Jewelry: Jewelry should be clean, elegant and softly feminine. It adds a touch of sophistication and delicacy to your look. Shapes are round, ornate, and flowing, while always remaining symmetrical. Circles, slight dangles, swirls, ovals, and clusters are all excellent. A slightly antique approach to your jewelry is best. AVOID: Sharp geometrics, heavy or chunky pieces, overly flashy jewelry, wearing too much jewelry or wearing no jewelry. Without further ado, from all that VERY LONG list of rules, here are patterns that I have found that I think fit the shape/line/detail rules. Obviously the fabric/color/print rules will be addressed by the fabrics chosen. All pictures are going to be pulled from the pattern websites, and I will link to the page in the text below. Also, unless otherwise specified, these are all patterns I currently own but have not sewn yet. Jackets: Jackets should be softly tailored with curvy shaping (subdued, not fussy) that gently shows the waist. Short to moderate lengths are best, although a longer length is possible in a belted jacket or one that has a very understated peplum. They are best with subdued added detail as shoulder tucks or gathers and tapered sleeves. AVOID: Overly tailored, sharp-edged, stiff jackets. Wide, boxy jackets that are unconstructed. Long, straight jackets that hide the waist. Extremely cropped jackets that are crisp and “perky.” Overly fussy or flouncy jackets with excess trim. This is Burdastyle.com “Piped Trench Coat 11/2012 #118.” It has the tailored look, but the edges are all curved rather than sharply pointed. It has slight waist definition on its own, but definitely with the belt. It is visually symmetrical from the front, but I think I would potentially redraft the back shoulder flap piece to come to a point at center back rather than off-center. However, I don’t know how big of a deal this detail on the back would actually be. This is the Burdastyle.com “Pea Coat 12/2016 #102.” It has the symmetrical, tailored look, with waist definition and rounded edges on the stand collar. I don’t think a plaid is soft enough for Soft Classic, because it creates too many lines and too much tailoring. This is the Burdastyle.com “Long Pea Coat (Plus Size) 09/2016 #138.” I definitely think the chosen fabric print does not do this justice, and it would look much more gorgeous in a soft color like ballet pink, where you can really see the detailing. It has soft tailoring with princess seams, and is symmetrical. The soft really comes in with the rounded cut of the collar, and the back pleating. While it is long and does not have a belt, the waist is defined well, and the back bar above the pleating does well to pull the waist in more. This is Burdastyle.com “Mint Trench Coat 09/2015 #105.” This coat looks fantastic in the light mint color, and it is easy to see the detailing. It is tailored, but with princess seams it defines the waist well, and the softly rounded corners of the collar, along with the curved seam of the back yoke, keep it from being too sharp and stiff. Also, I don’t consider this a true trench coat even if Burda does, unlike the 2012 piped trench I already mentioned. I think it could be considered a pea coat, or even a car coat, but without the belting, the shoulder flaps, it really lacks the elements that would qualify for a trench coat. Since I work in administration at a Montessori school, my “professional” look isn’t as structured as if I were to work in a more traditional office. Therefore, I do not wear suit-style jackets as a layer. They are not comfortable nor allow enough movement for the times when I assist with the children. Therefore, I have chosen to lump cardigans, which I do wear, in with “jackets,” rather than “sweaters.” In my opinion they fit this category better. This is the Mouse House Creations “Julia” cardigan. I think it is a perfect example of Soft Classic, with symmetry from side to side, slight tailoring with the wide band that wraps from neck to hem, but creating a curved line and just the right amount of drape. This is McCall’s M7199, and it is actually referred to on the site as a jacket for moderate knits, but I still see this as a cardigan. I think look “B” is the one I would call the most Soft Classic, with the draping front, but the tailored seaming on all versions is great, adding to the symmetry of the style. The look “D” is similar in shape, but intended to be a mix of colors/prints, which would give it too broken-up a look to work for Soft Classic. I think with “A” and “C,” they each create too asymmetrical a look, though I really wanted view “A” when I purchased this pattern. However, I have tried on numerous RTW tops in this style, but never ended up purchasing them because they never looked very good. This Burdastyle.com Jersey Blazer (Plus Size) 08/2016 #134 is interesting, because the structure is very jacket-like, though made out of jersey, I would probably classify it as a cardigan. However, the fabric notes recommend “jacket fabrics,” so I am not sure what they really want you to use. Regardless, the soft tailoring is definitely there, with the princess seaming on the front, but the curved lapels, the curved bottom opening, and even the curves around the bottom of the pockets. I have no idea if it would hold its shape made in jersey or something else with quite a bit of stretch, but if it did, I imagine it would be extremely comfortable. This is Delia Create’s “Pleated Pencil Skirt” (images from IndieSew), and the perfect Soft Classic pencil skirt. It has slight tailoring with the waist darts, and tapers in just a bit at the hem. It has a small kick pleat at that back that is barely noticeable, but probably highly functional. I think the fabric in the example here is perfect in both color and texture, keeping with an overall soft look. This Vogue V1324 (out of print, images from Tessuti) is another really good Soft Classic pencil skirt, with tailoring darts and curved seams that create the shape that hugs the hip, and then tapers in at the bottom. There is honestly a seemingly endless number of more basic, or slightly detailed pencil skirt patterns available, including Vogue 1389 (out of print, affiliate link), Burdastyle.com “Pencil Skirt 10/2016 #106,” Burdastyle.com “Panel Pencil Skirt 08/2016 #128A,” the basic Butterick 5466, and Burdastyle.com “Pencil Skirt (Plus Size) 08/2016 #130.” For a slight fancier change, you could go with Burdastyle.com “Pencil Skirt 01/2019 #119,” that has the basic pencil shape, but adds a high hip tie. In a softer fabric that this example, it would drape beautifully. This Burdastyle.com “Wrap Skirt 12/2015 #115A” is a nice in-between skirt, not really a pencil style, but not a true flare either. It does have an asymmetrical faux-wrap, but I think in the right fabric (this example is too heavy I think) it will show as a drape, and the curved hip yoke is very Soft Classic. I would only do it in the knee or midi-length, as I think the full-length would come off as overwhelming. For the more flared skirts, I think the Burdastyle.com “Vintage Gina Skirt #V9-50″ is great, especially in the example fabric. In fact I think the key to the flared skirt, which is listed as preferred shape for Soft Classic, would be to stick with fabrics in this style that drape very well, as opposed to more stiff fabrics that push the flare out far away from the hips (think Gertie-style patterns). For this specific pattern, I would remove the pockets as the lines are too sharp and take away from the draped look. For the Sewaholic “Crescent” skirt, what takes it from being a “no-no” circle skirt is that beautifully tailored yoke. It creates the symmetrical, clean lines that the skirt then drapes from, and in the correct fabric will look fantastic. The Sewaholic “Rae” skirt is an ideal not-too-full flare skirt, with an elastic waistband that creates the gathers. This Burdastyle.com “A-Line Skirt 03/2016 #101B,” if done in a softer fabric, would be another good gently flared woven skirt with both symmetrical, tailored details, and the waist sash to add drape. I think the block hem piece is less noticeable in this example than in the #101A, which uses even heavier fabric, but you could also just omit the separate piece and draw the top portion longer to create a clean, seamless look. This McCall’s M6966 is a great example of the lightly flared skirt in a knit, though the waist detailing is very plain. I think an appropriate belt or fabric sash would be a good choice when creating an outfit with this skirt. You may notice that I have not included ANY uneven hemline skirts which are mentioned in the Kibbe “rules” as a great choice, and that is simply because I really don’t like them. I also am not a fan of the hi-low hem tops, tunics, or anything else either. This is one area I am clearly taking the Kibbe Soft Classic rules and making them my own, which now makes it really MY style. For the record, I also plan on continuing to wear knit maxi skirts in the summer because once it hits 100 in Texas, nothing else is comfortable, even though long, straight skirts are number one in the AVOID section. I think I look fantastic in knit maxi skirts, styled with flip-flops, a knit tank-top, and a long necklace. Pants: Pants should be softly tailored styles in lightweight fabric. Soft pleats, slight gathers, and a slightly tapered leg are nice details. Hemline should be just below the top of the ankle so as to show a touch of foot or shoe. AVOID: Man-tailored styles with sharp edges. Wide, unconstructed or baggy styles. Overly fussy pants with excess trim or detail. The pants area is one where I really want to branch out more that what is suggested for Soft Classic. The reasoning for this has to do with my own personal body shape. For my height, I have a longer torso. I also have an equal distance between ankle and knee, and then knee and hip. So on me, ankle pants only look good on my frame when they are fitted/skinny from waist to ankle, AND I am wearing a more open shoe (like a ballet flat or sandal). Pants that have a more “trouser” style, like a bootcut or small flare bottom, look great, especially when they come to barely off the floor, because they create a balance for my hips, and create a very curved shape. Since I am “Soft Classic,” I took a look at the rules in the categories that make this up. The rules for Kibbe’s “Classic” in pants area include the legs being slim and narrow, rather than fully tapered, and it doesn’t mention that the hemline should be anything. The rules for Kibbe’s “Romantic” in the pants area focuses on showcasing curves. I think the style I want is still a blend of these two areas, leaning more toward Classic with a bit of the Romantic thrown in, but takes current pants style shapes more into consideration that what was available in the late 1980s. This is McCall’s M7726, and might be a great Soft Classic pant pattern overall. It actually offers a tapered leg above the ankle option, but I won’t wear that. However, I would take this look “D” and narrow the legs a bit so they don’t venture into the area of wide or baggy. The waist is perfect, with the soft tailored pleats and the waist tie. The Closet Case “Ginger” jeans pattern offers a high-waisted skinny leg jean, that fits right into the Soft Classic, except being a jean, it isn’t softly tailored, nor in a light-weight fabric. There is also a straight leg option that leans more traditional Classic. The Closet Case “Sasha” trousers are straight-up Classic style, with no soft elements unless you do the ankle length, though I won’t. This is where I think I will have to create an outfit with a much softer top, that all blends together, to give the appearance of one solid “look” that will be much more difficult than even if I was wearing a basic pencil skirt. The Burdaystyle.com “Editorial Pants 08/2013 #118C” is another very Classic style, this one with the hint of a bootcut that doesn’t really show well in the line drawing, but is evident in the example with the flowing fabric. Both the Hot Patterns “Classix Nouveau Skinny Bootcut Jeans,” Vogue 8774 (out of print), and the Burdastyle.com Bootcut Flannel Trousers 10/2011 #127 all have a slightly more bootcut shape, but again, are Classic rather than Soft Classic because they are jeans, and have no softness at all when done in heavy denim. I think a ponte fabric would give more curve-hugging, or even a lighter weight stretch-twill. Also, the patch pockets on the Hot Patterns jeans, while adding to the symmetrical and tailored look, might cut too much across the curviness of the thighs. The Burda have details around the pocket area as well, but the curved top-stitching might work better than the straight. The Sewaholic Thurlow trousers are truly the ones I hope will look good on me, and are my image of the ideal pant, especially for work. With the slight flare, the curve of the hip, I want to make these in all the fabrics. However, I still think they are more Classic than anything. Both the Vogue 1416 (out of print) and the Baste+Gather Birkin Flares are two other patterns I have collected in my quest for the perfect pant pattern. The Vogue pattern doesn’t have a waistband, and I am not sure how that would look (or if it would even be comfortable), but you can see both the tailoring and the fluidity due to the fabric choice, making it seem to me like it fits in the Soft Classic group. The Birkin flares are funky and look spectacular on the model, but her body shape is definitely not similar to mine, and the flare might be too much. The Burdastyle.com Flared Pants (Plus Size) 02/2014 #143 are similar to the Birkin, but look like they might have more hip room, though at this point I don’t know if that is good or bad. Blouses: Blouses should be soft and elegant with soft edges or a suggestion of intricate detail. Soft bows, slight lacy edges, jabots, and draped necklines are excellent. Subdued trim – appliqué, shirring, gathers, beading, etc.- is also good as long as it’s not overdone. Fabric should be lightweight-with the slight sheen of silk best. Very soft and sheer linens, batiste, voile, etc., are also elegant. AVOID: Sharply tailored styles. Wide, unconstructed styles. Animated, “perky” styles. The Halla Soho top has a fantastic cowl neck option, giving a good drape. The raglan style sleeves coming from underneath the cowl adds a soft tailoring. McCall’s 6963 calls itself a cowl neck, though I would say it is more of a drape. It has options for sleeveless, short-sleeve, and long. The Sewaholic Renfrew top is a pattern I have had forever, and I love the cowl version with elbow-length sleeves. The Burdastyle.com Waterfall Blouse 10/2018 #112B, Pullover 08/2017 #104, has a sharp edge at the end of the drape, but if done in a print like this one, that blends very well into the under layer. The Burdastyle.com Pullover 08/2017 #104 is similar to the Soho top, with the cowl and raglan sleeves. The StyleArc Franki top has a good small drape-neck as well. This Gertie B6285, Cashmerette Dartmouth top, Itch to Stitch Brasov wrap top, and the Style Arc Kendall top, the Burdastyle.com Draped Jersey Shirt 09/2018 #121A, all have elements of the wrapped style, that offer soft edges, draping necklines, and gathers. The Hot Patterns Classix Nouveau What’s New, Pussycat? blouse, Classix Nouveau Scarf Shirt, McCall’s 7053, Burdastyle.com Leopard Blouse 08/2013 #108, Chiffon Blouse 08/2013 #119, are all tie-neck style that create the soft draping. The Burdastyle.com Knotted Blouse 08/2016 #125 has that same style, but less waist definition. I think if I tucked it into a pencil skirt or high-waisted pants, it might give the right look. I have never worn a peplum before, always adhering to the rule that if you have hips, don’t add more there. However, I think the right peplum might add the right kind of softness to an otherwise more Classic look. The 5 out of 4 Sydney peplum top has great soft draping from the defined waistline, with a scooped neck. The George & Ginger Jawbreaker peplum has the same draping from the defined waistline, but with more soft tailoring at the neckline in the form of pleats. I think the peplum style will need to be styled with a pencil skirt or skinny pants/jeans in order to create the correct look on my body, but I am curious to try one. There a few tops patterns I have that do not neatly lump into the above categories, but still fit the Soft Classic rules. The Burdastyle.com V-Neck Blouse (Plus Size) 07/2016 #129A has beautiful pleating and a wide neckline. The Burdastyle.com Kaftan Style Blouse 06/2018 #112 has the same undefined waist problem, but if tucked, the pleating and gathers will create a beautiful drape. I do think the fabric choice for the sample here is excessively busy, though. The Cashmerette Harrison shirt has beautiful Classic style tailoring, with no true softness, but I think it can be added to a much softer skirt, or even underneath a softer sweater, to help create a complete outfit. Since Kibbe recommends sweaters in lightweight knit, many of the patterns for tops, especially the cowl or drape-neck, can be used for this as well. Also, I only recently have thought about sewing my own sweaters, or even purchased fabric for trying, so I just don’t have that many sweater patterns. This Burdastyle.com Raglan Sleeve Sweater 10/2016 #114B is a little heavier knit, but the open neckline, and even the button detailing, conveys a softness without being too much. This Burdastyle.com Off the Shoulder Sweater (Plus Size) 09/2018 #125 is a very good Soft Classic sweater, with the cowl draping neckline (I would not wear it off-the-shoulder), but I do think it would be too long and need to be shortened. The model has it as almost a tunic length, but not long enough to be a sweater dress, and I think it should be more at the hip, or if left a tunic, then add a belt to accentuate the waist more. Both these Burdastyle.com patterns are problematic for the Soft Classic group, with Pullover 11/2012 #128 being more so. I think in the right fabric, with the right outfit, it might work. It has tapered to the wrist sleeves and an open neckline, but is boxy around the waist and the banded hem might cut awkwardly across more curvy hips. Layered Long Sleeve Shirt 01/2016 #103A is much more gathered and draping, but the front of the sweater is plain and flat, while the back has the detailing. Dresses: Should be graceful, flowing, and elegant. Flared shapes are best, and waist definition is essential (although it may be slightly dropped in a very clingy fabric). Soft detail with a suggestion of intricacy is excellent. Draping is always perfect! AVOID: Severely tailored styles. Wide, unconstructed styles. Overly fussy or flouncy styles. Colette Wren, Colette Myrtle, Halla Carefree dress, Sew Caroline Out and About dress, NewLook 6802 (out of print), Butterick 5749, Vogue 1235 (out of print), Cashmerette Turner, and Cake Tiramisu (out of print?) are all knit dresses in the style that best fits Soft Classic – fitted at the waist with a small flared skirt. Each has their own neckline detailing, or sleeve style, that makes them different. The woven selection of this style is just as large, with variety in necklines and sleeve options, but similarity in either a gathered or pleated skirt creating a slight flare. The issue wovens could have, though, is with too stiff a fabric creating a too elaborate flare. There is Burdastyle.com Tank Dress with Gathered Skirt 02/2011 #104, Cashmerette Upton, Vogue 1223, Burdastyle.com Tunic Dress (Plus Size) 08/2016 #132B, Feminine Dress 07/2016 #111A, Butterick 5750, Peppermint Magazine Summer Sundress, Vogue V9100. The Burdastyle.com Maxi Dress (Plus Size) 06/2016 #133 fits into this category, though it is a maxi style in length. I wanted to point out the harsher lines of the back up against the softness of the draping skirt. I think it is a fantastic mix of the Classic with a hint of Romantic softness. Just like the wrap-style tops are good Soft Classic items with the waistline accentuation and soft detailing, wrap-style dresses do the same thing. The Cashmerette Appleton has less flaring and drape from the waist, but still is not clingy. Burdastyle.com Wrap Dress 08/2017 #109A has pleating coming off the front wrap, which creates more draping. Sheath Dress (Plus Size) 07/2017 #124A uses this same technique, but in a sheath style. However, the correct fabric must be used so that the dress doesn’t end up clingy overall. Wrap Look Dress 12/2018 #107B is a wrap-style top with a flared skirt attached, which is probably the perfect Soft Classic mix. Butterick 5030 does the same, but is a true wrap. It also includes different sleeve and collar options. Shirtdresses were one of those things that when I thought I might best fit into the “Romantic” category I was going to get rid of, but a Soft Classic can definitely wear due to the symmetry created by the look. I have amassed quite a few over the years, though again, I have been a lazy sewer and more of a hoarder before my intention-focused 2019. Styles like Sewaholic Nicola, Cashmerette Lennox, Colette Penny, and McCall’s 6696 all offer a fuller gathered skirt from a waistband on the dress. McCall’s 6885 and the Cashmerette Harrison dress (the latter of which I do not own) instead define the waist strictly through the use of a belt or sash. 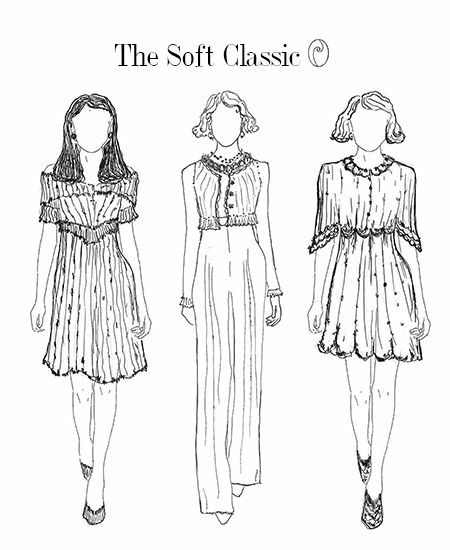 There are a handful of dress patterns I own that do not fit neatly into a category, though do follow the rules of Soft Classic. The Burdastyle.com Tie Waist Dress 03/2016 #102A is the one pattern I have listed that I actually have made (for my cousin’s wedding, in a navy blue stretch poplin). The pleating at the neckline, and then the pleats created at the waist by the sash are flattering. In fact, it looks good on me, though the poplin is a bit stiff, especially since I fully self-lined it. Burdastyle.com Keyhole Flutter Dress 12/2016 #118A has pleating around the bust, drape at the sleeves and skirt, but the waistline isn’t “defined” in the same way as most of the other dresses. The seam that comes from between the bust goes down to the sides at an angle, and then meets at a low point just below the back hipline. It is great tailoring, and I don’t think too much, but it will be difficult to tell if it will be flattering on. Long Sleeve Dress 12/2015 #123 has given me concerns of a similar nature because while the dress here has good waist definition, flared skirt, and gathers under the bust, it is difficult to tell the exact fit of the bodice. On the model (rather than dress form as here), it fairly swallows her. Also, those gold button details down the arm are definitely in the overly ornate category, so I would pull all that off. The Colette Rue dress is one that I would very much like to lump into the woven fit and flare category, but when it came out, there were a bunch of problems with the bodice fit, and the pattern ended up having some redrafting happen. I received the new pieces free, but I was already going to have to figure out a bust adjustment to the area around the piping, but now also figuring out where to put new pieces in had put me off. However, this dress is on my #makenine2019, so I am committing to tackle it! I hope it works out, because the tailoring around the waist and ribcage is beautiful, and then with the pleats from the waist, it is a great Soft Classic shape, especially in a softer fabric. Kibbe doesn’t address jumpsuits in the Soft Classic section, and I am going to assume this is because they didn’t exist in the 1980s. I have never worn a jumpsuit, but I think both of these would qualify for Soft Classic, each with a soft tailoring, waist definition, and drape similar to what would be acceptable in a dress. The first is Burdastyle.com Jumpsuit 06/2017 #111, which has been sampled in a light woven. The second is Open Back Jumpsuit 04/2016 #112A, which is sampled in a jersey knit. Evening Wear: Symmetrical, flowing shapes. Slightly ornate detail. Lightweight, draped, and sheer fabric. Slightly sparkly fabric. Smooth fabric. Slight ornate trim (but not fussy). Chiffon ball gowns. Long gowns with flowing skirts. Beaded bodices and jackets. Ornate and fitted jackets, over gowns (shoulder tucks, shirring, etc.). Silk dresses. Elegant dinner suits with fitted jackets. I almost never have occasion to wear evening wear of the type Kibbe is discussing. The one pattern I own for this sort of thing is Burdastyle.com A-Line Cocktail Dress 03/2016 #122, which is very similar to the other woven fit and flare styles, just done in raw silk. I think I could definitely adapt many of those to be more fancy just based on the fabric choice. Most recently, I have self-drafted a black lace cardigan with draping in the front to wear over a silk snakeskin print camisole with jeans and boots for a themed gala. The last time I wore a ball gown style was my wedding dress (which my mother made! ), almost fifteen years ago. If you’ve made it to the bottom of this post, CONGRATULATIONS and thank you for sticking with me. I am not going to go into detail at this point about hair, makeup, or any of the other things Kibbe discusses for the Soft Classic category. I hope you have found some inspiration along the way! Thankyou! I’m leaning towards soft classic in trying to pin my Kibbe down. This post has been really helpful. I want to dig all my patterns out and do similar. I have similar thoughts on pants too, and think my best look are more classic pants. I am so glad that I could help. I was actually surprised when I went through my patterns how I obviously naturally gravitate toward the soft classic style, even though I didn’t end up actually sewing (or wearing) it that much, I think due to both laziness and negative body image. Good luck on your own Kibbe journey, and if you end up doing a similar posting, I would love to see what you come up with. Love so many of these patterns! They will all look so good together!